After breakfast at Cao Lai pension, we headed back to the coast where we saw these boats sitting on the mud, as the tide was out. We found the dike and were able to ride along it a little on the see-ward side. 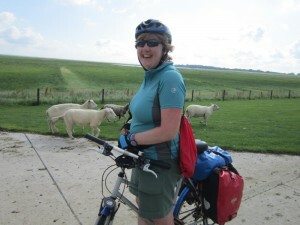 There were lots of sheep grazing – they were not at all shy of the bicycles. They were also not shy about leaving their droppings on the road, so we were quite happy to cross over and ride a little while on the other side of the dike. 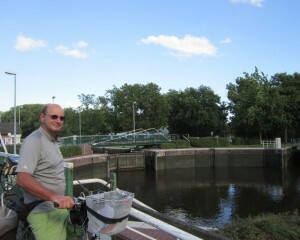 We then joined the Ems-Jade Canal at Sande. We had a strong head wind and parts of the canal road were very rough, which slowed us down. Eventually the road improved and we stopped to have a snack – bananas and chocolate kisses. 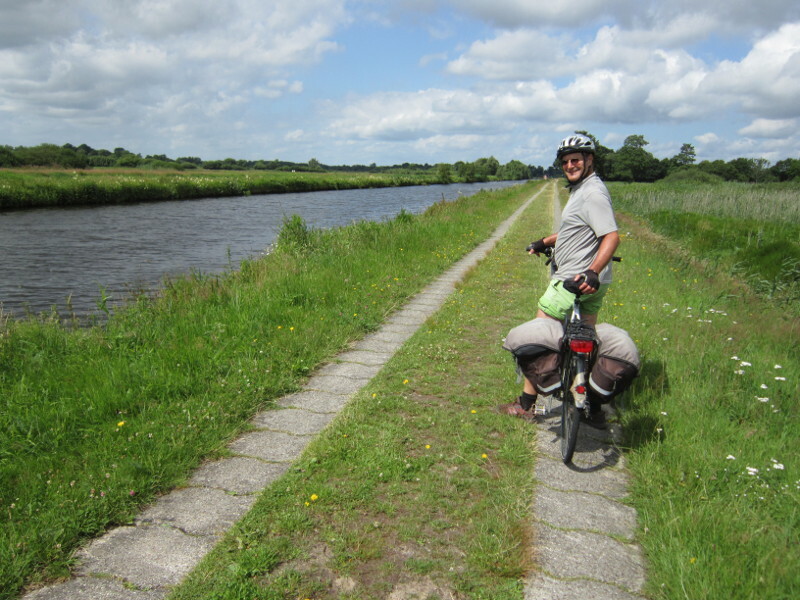 We headed off the canal through country cycle paths to the outskirts of Aurich. 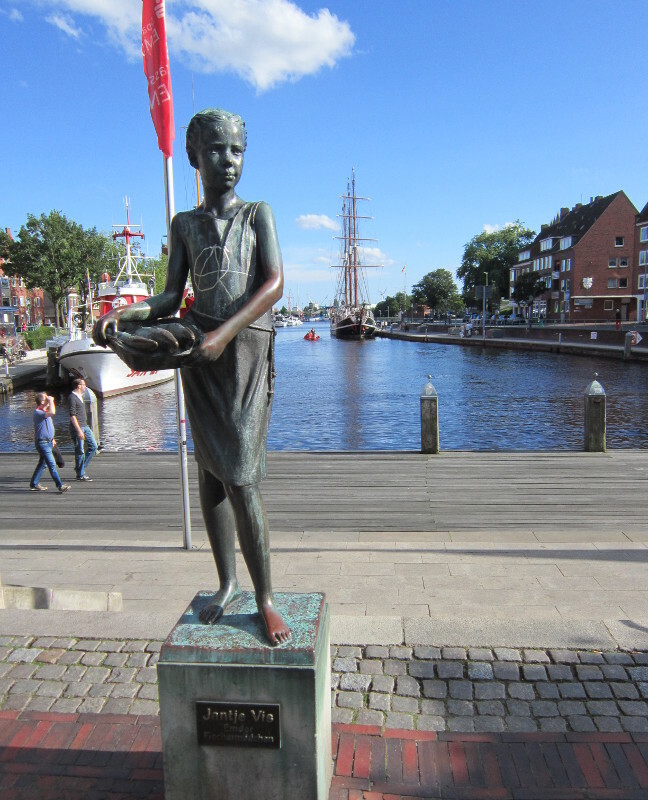 Here we decided that we could make it to Emden that day, instead of staying in Aurich. 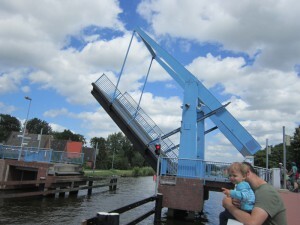 This will enable us to take the ferry to Holland directly from there in the morning. 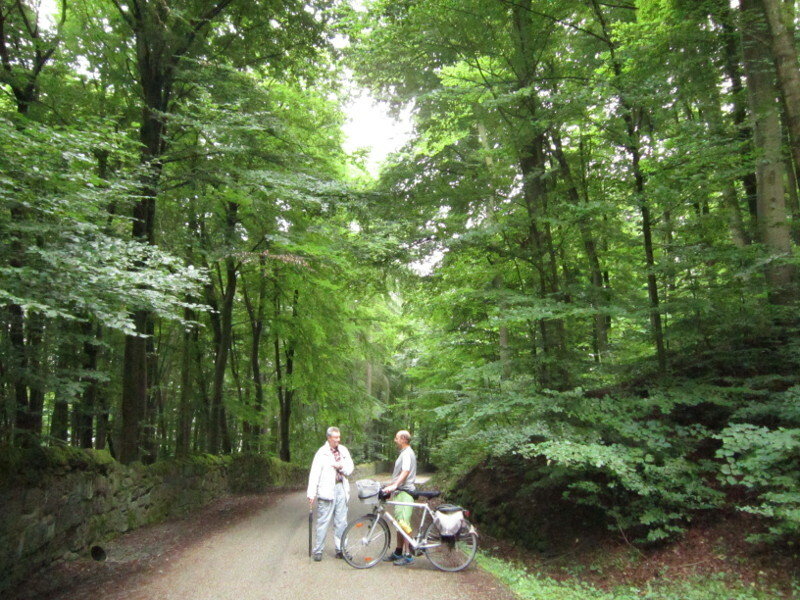 We rode through the Ihlower forest. 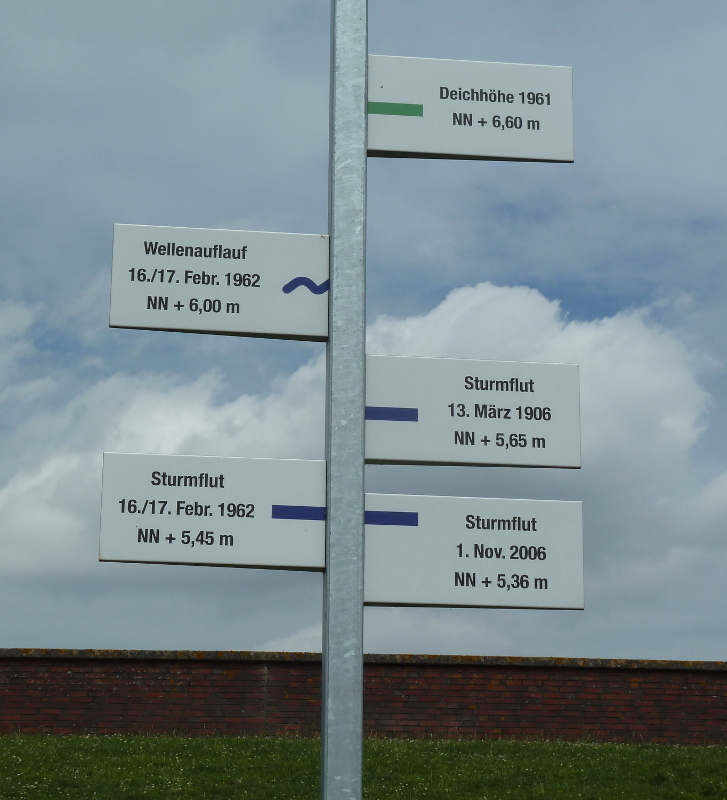 There were sign posts pointing to a Kloster Church which we followed but couldn’t find – we just ended up in a muddy field. So we headed back and re-emerged into civilisation. We saw some incredibly neat villages, including Simons Wolde, with red brick houses and manicured gardens. 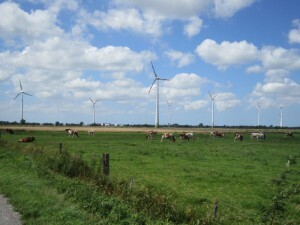 The last ten km or so of our journey was through lots of open fields with wind farms. 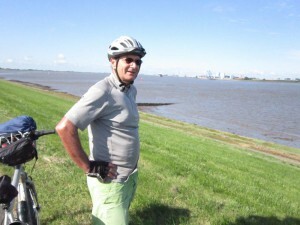 There was a steady head wind, hard work for cyclists. 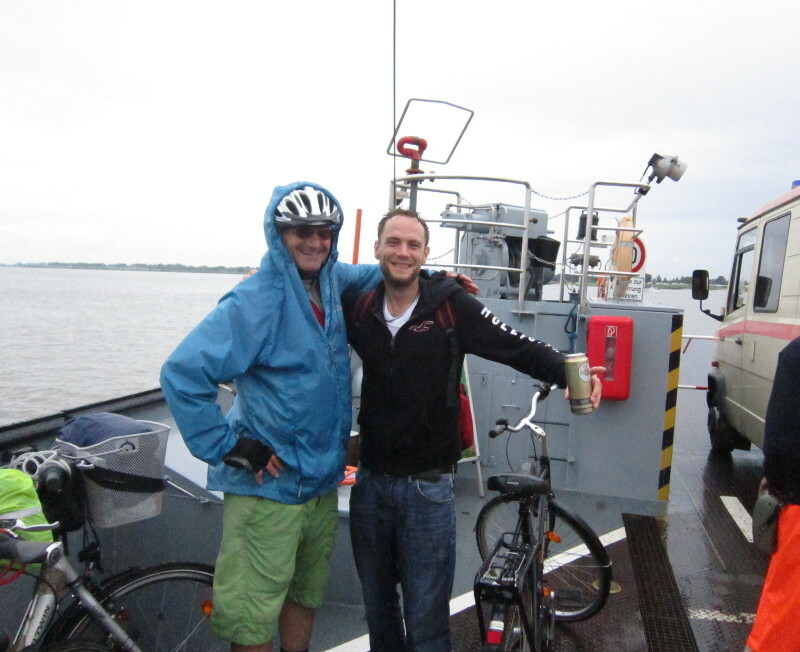 Finally we reached Emden (after 88km mostly against the wind). The town is lovely with a harbour, canals and sailing boats. 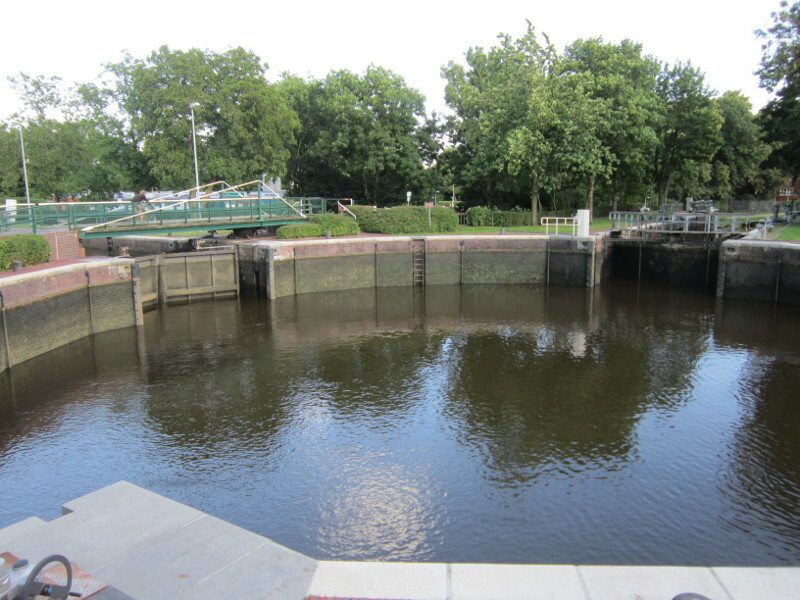 It also has a special four way lock, called the Kesselschleuse, which connects four canals that all have different water levels, leading via locks into a central basin. 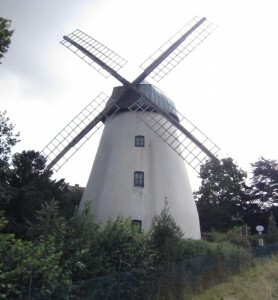 It was built in 1885/86 and is the only one in the world. 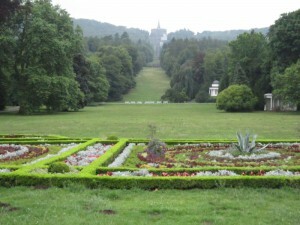 We had a ride along the top of where the old town fortifications were – they have been made into a park circling the town. We couldn’t find cheap accommodation, so ended up in the youth hostel. 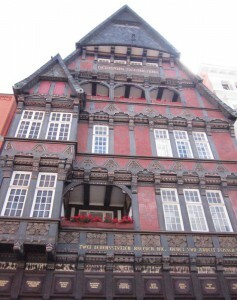 This youth hostel was also not cheap, costing the same as most of our hotels. But it was OK and we had a good picnic in the garden that night. 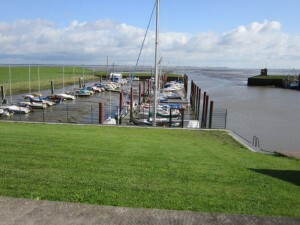 Bremershaven harbour looks a lot better in the sunshine. 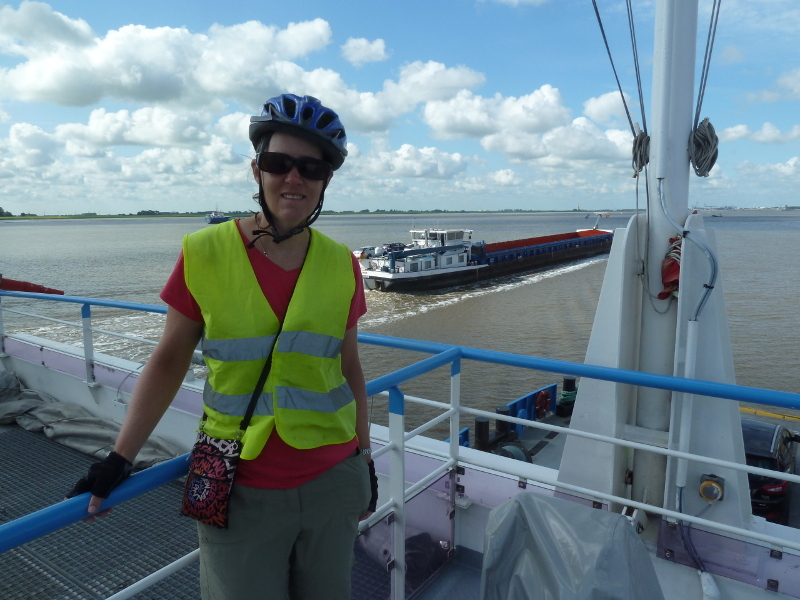 We got our first look and feel for the north sea on our ferry trip between Bremershaven and Blexen. From here we rode alongside the sea dike to Burhave, which was fairly monotonous. 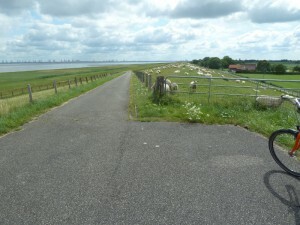 There are often sheep grazing on the dike. The photo below is taken from the top of the dike – but most of the cycle path is on the landward side. We stopped at the tourist info at Burhave for some maps. 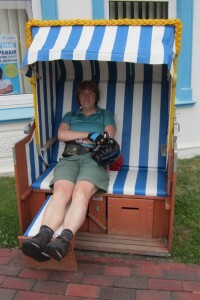 There were lots of tourists sitting on the beach or walking and cycling around. 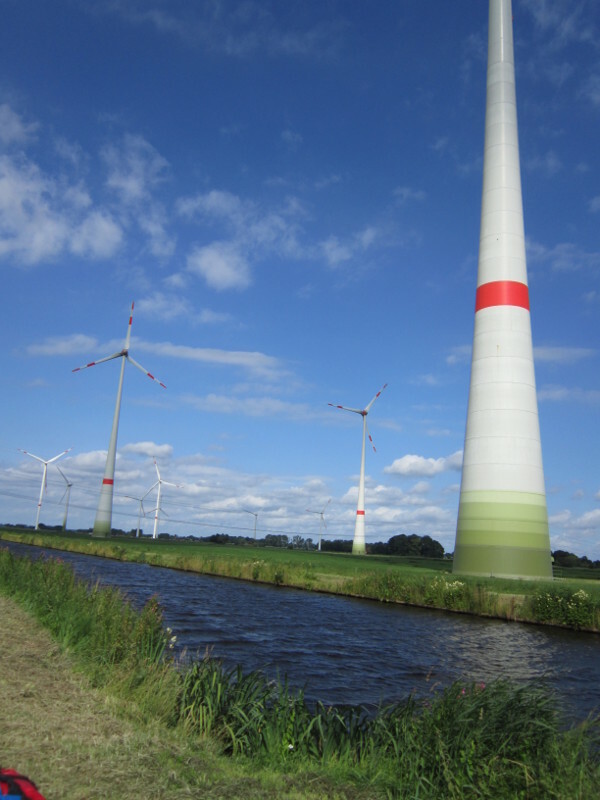 We decided to head across land a bit, for a change from the dike and headed to Stollhamm. The land is very flat with lots of little water channels running through it and the horizons are far away. There are cows grazing and the fields are very green. Every now and then there is a little village or some wind turbines. 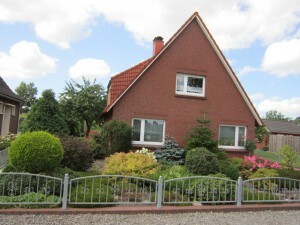 The houses here have a different style as well, brick with A shaped roofs. 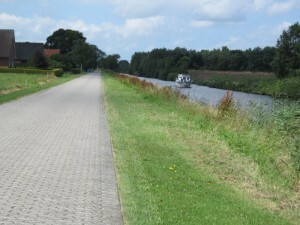 After Stollhamm we had another long ride, mostly alongside the dike to Dangast. 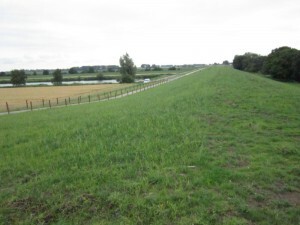 In a couple of places we could get onto the dike for a view on the other side. The sea is very far away and shallow looking, with lots of marshy land in between. 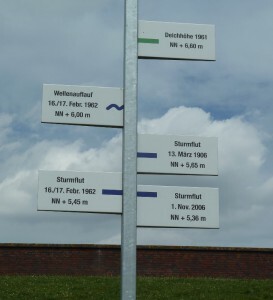 It seems impossible that the sea will get up as far as the dike, but these signs show that the water level has been that high in the past. 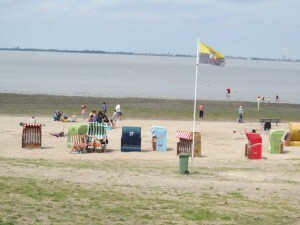 There were many people on the beach at Dangast – they sit in special chairs that can be hired to shelter you from both the sun and the wind. 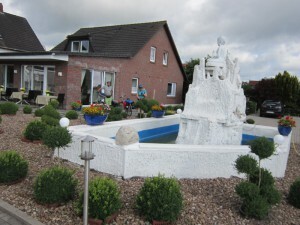 The town was very touristy and lively, with a caravan park and hotels, swimming pool, play parks and so on. 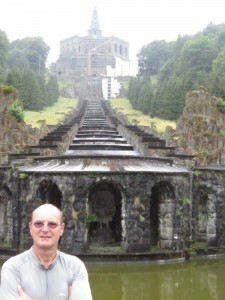 We stopped at the tourist info and found out about a pension (Cao Lai) about 5km away in Varel. The pension is alongside a Thai restaurant and is memorable in that we had a shower and washbasin in our bedroom (thankfully the toilet was separate). 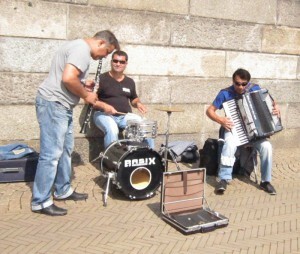 We had our latest start so far today after our evening out in Bremen – and only got going at 10am. 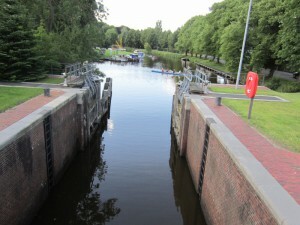 We started out in a light rain and left the city through the Burger Park, near the university – going past a large lake in the park. It was easy getting out of the city in this direction and incredibly quiet riding through small towns alongside the river. There were nearly no people around, probably due to the bad weather. We saw some people rowing on the river every now and then. We also spotted three deer standing in a field. 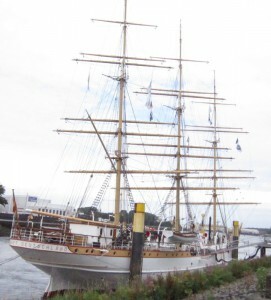 There is a harbour at Vegesack, where the Schulshiff Deutschland is moored. 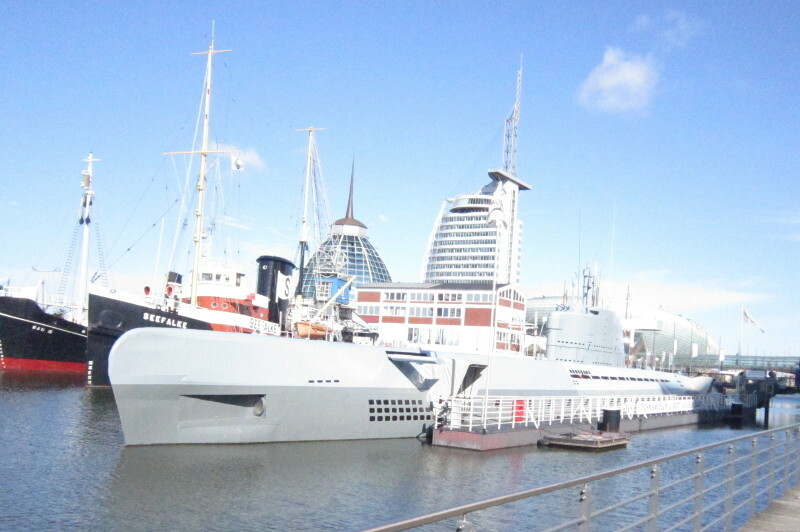 It was was employed as a school ship for the merchant marines beginning in 1927 and is now maintained as a memorial and museum ship. We came to a dyke just after Rader, which we rode alongside for about 10km. The route then took us along narrow country roads, too narrow for two cars to pass each other, with regular little towns. 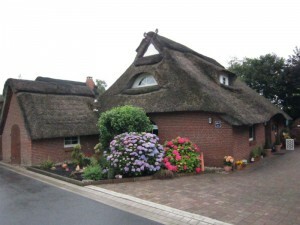 We noticed that many of the houses have thatched roofs in this area – and lots of very neat gardens. The weather became very grey and the the landscape flat. 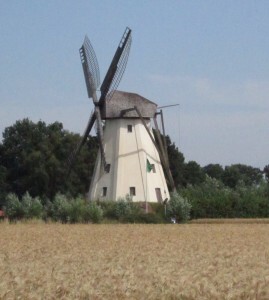 The wheat fields have largely given over to dairy cows and some sheep. 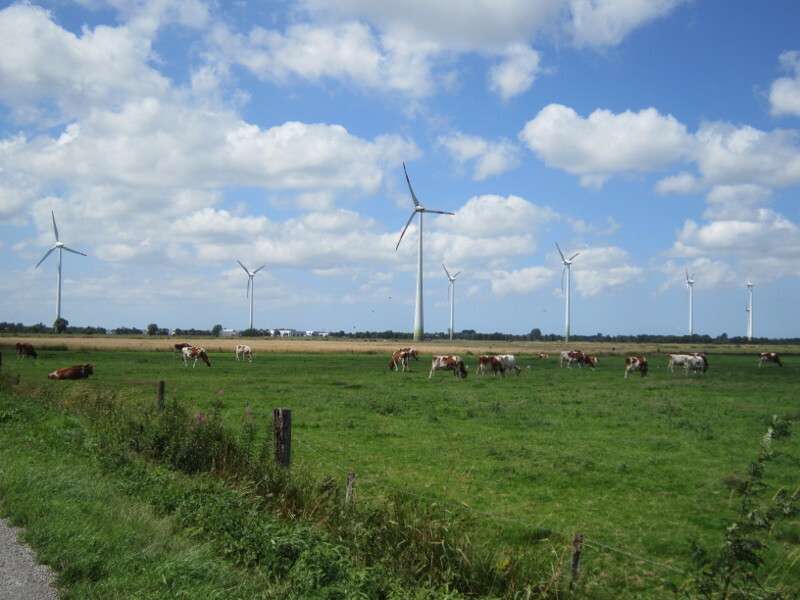 The cows seemed lazy – lying down in the fields. We ended up on a peninsular and had to either back track or take the ferry from Brake to Harriersand. We decided to take the ferry. There was a 45 minute wait for the ferry, so we had coffee at the nearby cafe and restaurant. There were lots of people there – either eating lunch or waiting for the ferry like us. It began to rain heavily just as the ferry came and we got soaked entering and leaving the ferry. Then we cycled a few km north to find the next ferry back across from Golzwarden to Sandstedt. 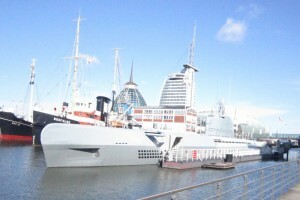 This was a bigger ferry that also took cars. It had stopped raining by this time, so the ferry ride was more pleasant. 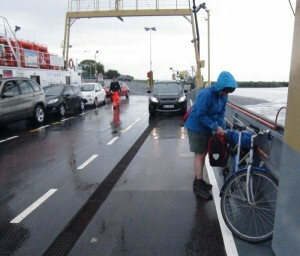 There was one other cyclist taking the ferry, travelling with a beer in his hand! I think we had more fun than the people sitting in their cars, even though we were wetter. 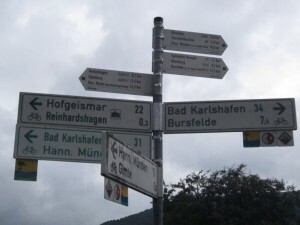 From there the route was along little town roads, we dried off and got wet again as the rain came and went. 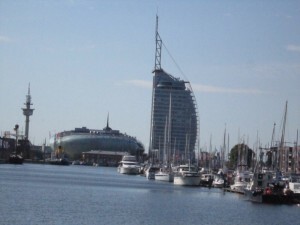 We entered Bremerhaven along busy roads, not very pleasant. 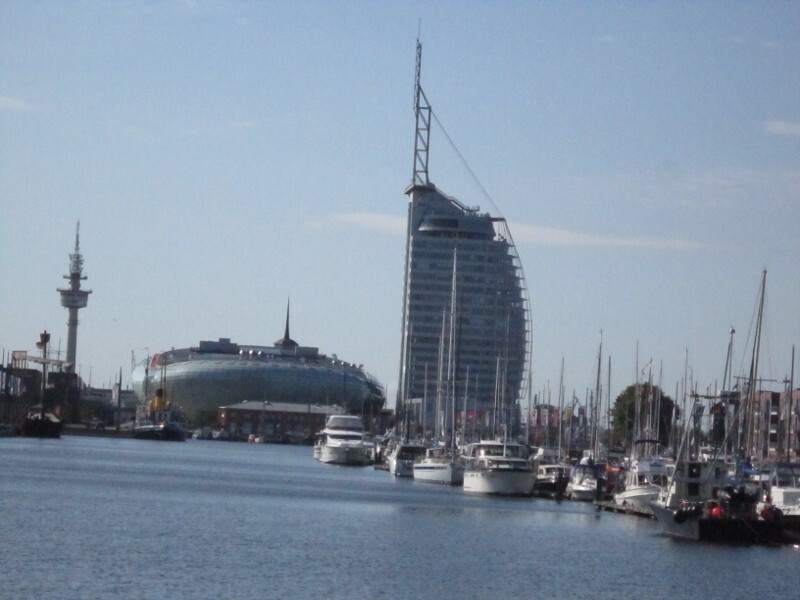 Bermerhaven has a very modern looking city centre, around the harbour. 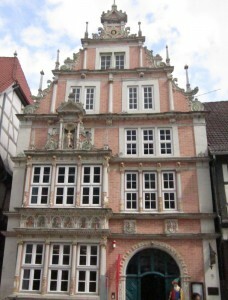 The tourist office was open and helped us book accommodation in the youth hostel, which was fine. We walked around the shopping centre before finding a nice kebab shop where we devoured pizza and kebabs – the weather was still wet and we were very hungry. Our day started with another excellent hotel breakfast. The first part of our ride was through some very flat land, with vast wheat fields. 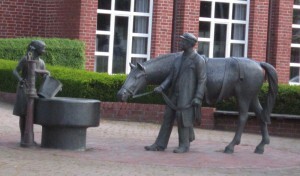 This is still horse country, as evidenced by this statue in Daverden, one of the first towns. 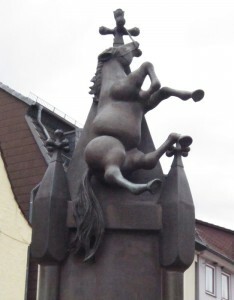 We also saw many other references to horses, such as horse motifs on the gateposts of large properties. There are also a lot of beautiful horses grazing in the fields. 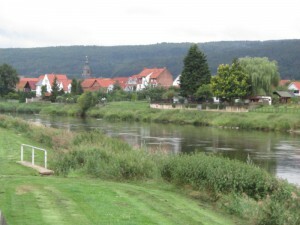 Our route still followed the Weser river, though often you could not see the river, as we travelled through farmland or small villages. 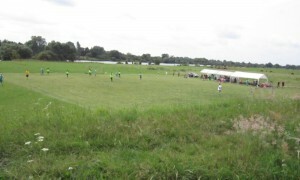 We paused to see this soccer match in progress, after a bit of a detour along a rough riverbank path. 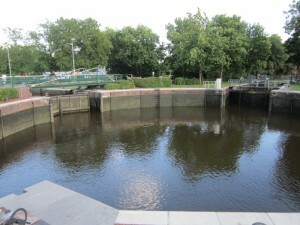 Part of the river is canalised, and there was a lock, even though the landscape is so flat. 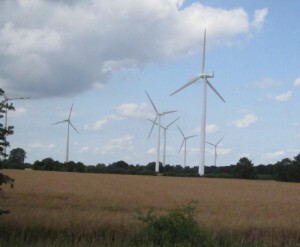 There was a big wind farm alongside the wheat fields as we were getting closer to the city. 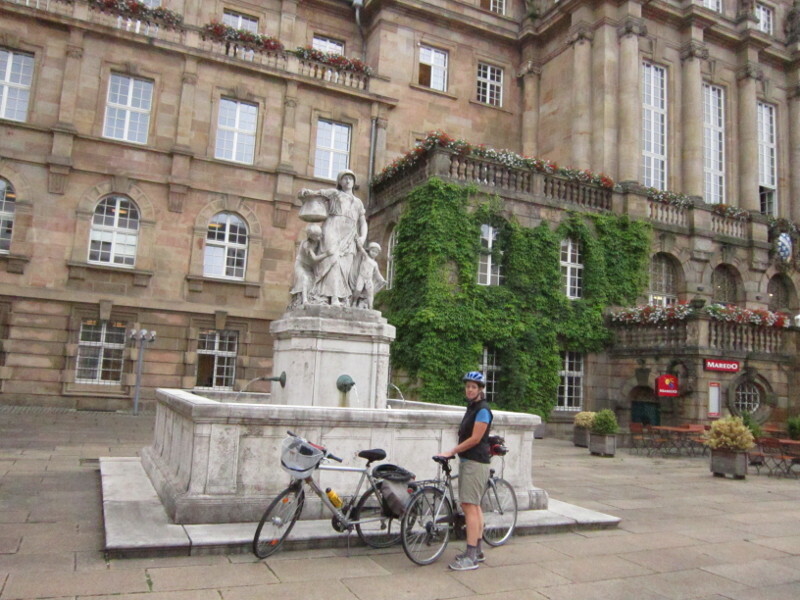 Today was a short ride, only 45km to Bremen – we took a bit of time riding through the urban outskirts into the centre of the city. We found our super modern accommodation (7 Things Your Basic Hotel) near the university and did some sightseeing. 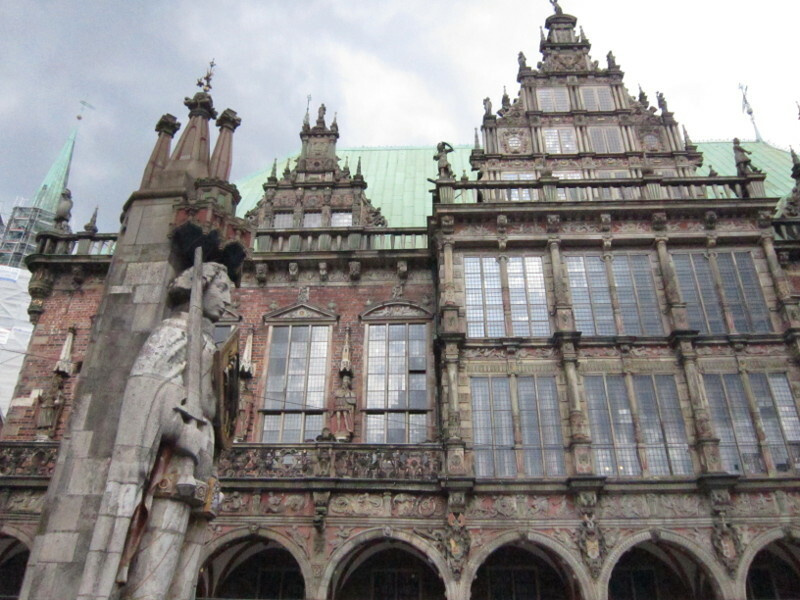 The old town has some amazing buildings including a huge Cathedral. 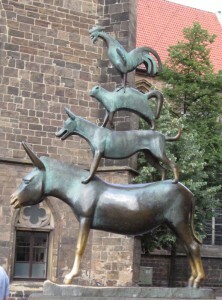 The folk tale about the Bremen musicians (a donkey, dog, cat and rooster who scare away robbers) is very popular and it is hard to take a photo of the statue, as there are so many tourists photographing themselves next to it. We ate traditional pea soup with sausage at an outdoor market. 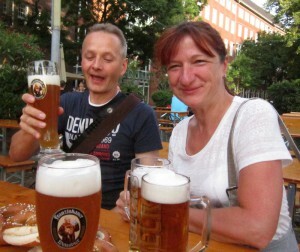 Then Andreas, who we had met in Gailingen phoned and said he and Silvia would come through from Hamburg to see us, and that they would meet us in the Alex pub in the city centre in an hour. We thought it would take longer, and went for a little walk around. We were surprised when he hooted at Kris on the street just as we were returning to the pub. 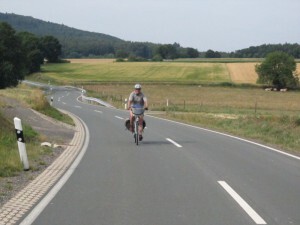 He had ridden at speeds of up to 200km per hour on the autobahn to get there so quickly. They then booked a hotel room near the city centre, so they didn’t have to drive back that night. We had another memorable evening together. 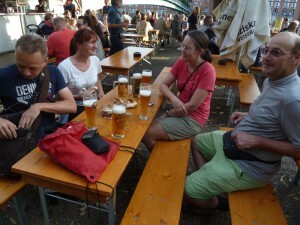 First we went to a beer garden along the river front for beer and bretzels. Then we had a walk along the waterfront, where a festival with lots of music and food (and hundreds of people) was in full swing. There were a number of groups of hen or stag parties walking around. The German tradition is that the prospective bride or groom has to sell things to raise some money – usually little bottles of liqueur. We bought some from this lady. 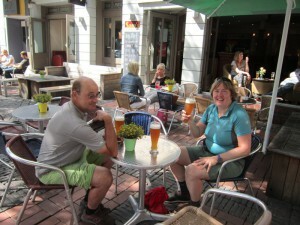 We had a final beer at the Alex pub, where our bicycles were parked. Then a slow ride back to our hotel, some km away but through a quiet part of the city alongside a large park. 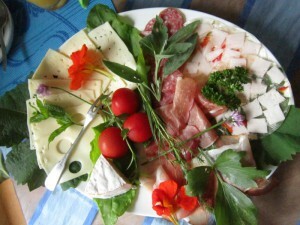 We started the day with this wonderfully presented breakfast at our Minden bed and breakfast hosts. 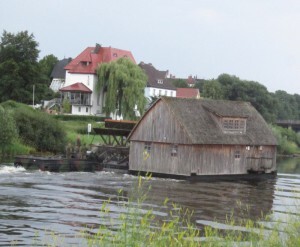 Right at the start of our journey we saw this startling sight on the river – we believe that it is the old water mill that we tried to find in Minden the day before – we were told it was being restored. It looked like the military were assisting in transporting it on a barge back up the river. 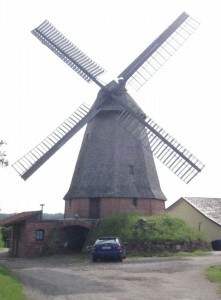 This old windmill was at Petershagen, near a nuclear power plant – which had sponsored the restoration. 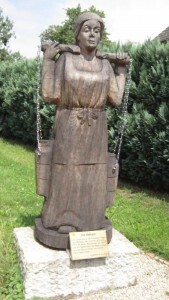 The next town was Stolzenau, which had cute statues of little fat people dotted around the town centre. 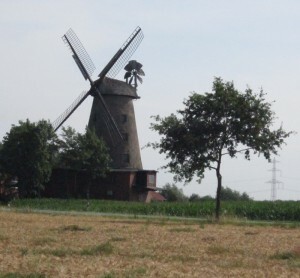 We spotted some more old windmills in the countryside during our morning ride. 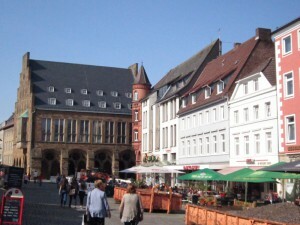 Although the ride had started out relatively cool, the heat began building late morning and it was very hot when we reached Nienburg. 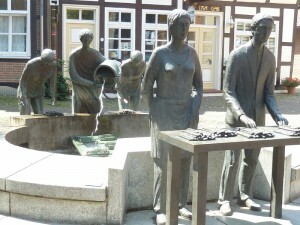 We stopped here to admire this fountain and statue of people washing asparagus (spargel). There was a bicycle shop on the main road so we bought a water bottle holder for Ester, which Kris installed, and some bicycle oil for my squeaky chain. 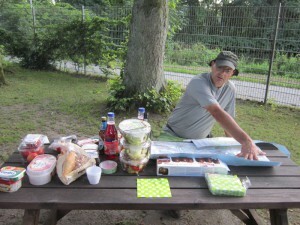 Also some ice cream and juice from the supermarket to keep our energy up. It was still early in the afternoon, so we decided to carry on. 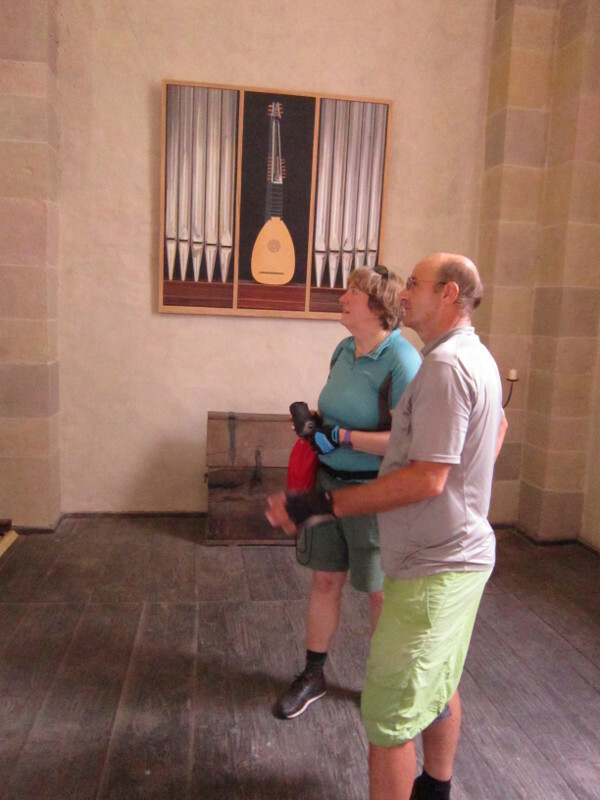 We realised that we had left town slightly in the wrong direction, and corrected and went to Eystrup. We were told there was one hotel in the town but we decided to move on to the next town. At Darverden we stopped and bought some cold drink and looked for accommodation as it was already 4pm. We couldn’t find any so we decided to continue to Verden, only 10km away. We got very hot that afternoon, but the last part of the ride was more pleasant as there was a bit of shade alongside the road. 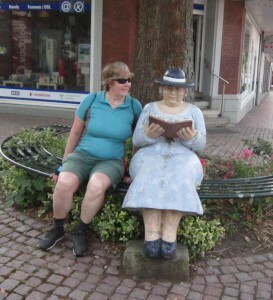 We got to the tourist information at Verden at 4.45pm, just in time before they closed. The lady there immediately offered us some bottled water because we looked so hot. 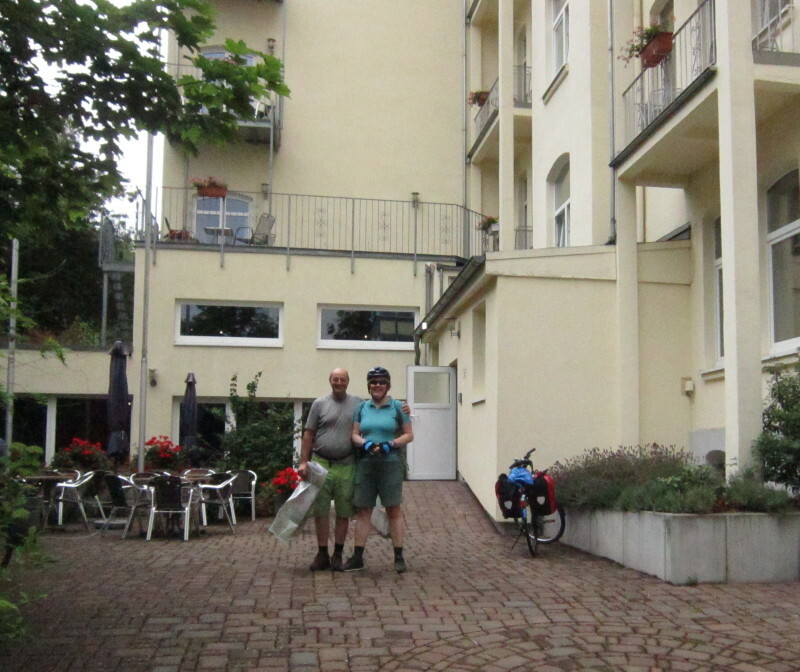 She helped us find a reasonably priced hotel – the Werdenhof. After checking in, Kris replaced the rear tire on Jenny’s bike, which was wearing unevenly and getting wobbly. 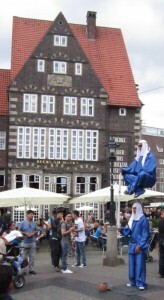 We had travelled 105km and we were tired and famished, so we ate kebabs from a cafe on the main square. 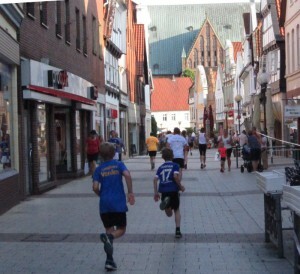 There was a big marathon around the town that evening and we watched the runners (of all ages) go by as we finished our kebabs. Later on we explored the town a little more, and ate an ice cream outside the horse museum. 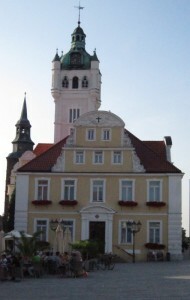 The marathon went on for a few hours, making it difficult to move around the old town centre. 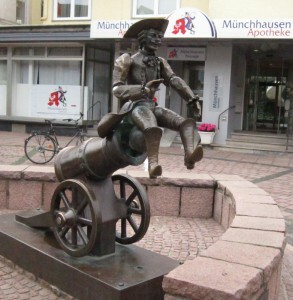 Verden is known as the “riders town” (Reiterstadt) and there are lots of references to horses and horsemanship all around town. 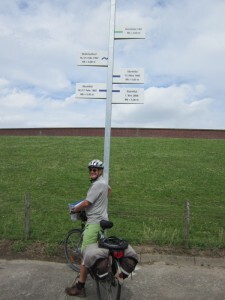 Another ride along the Weser cycle route – a real “path of tales”. 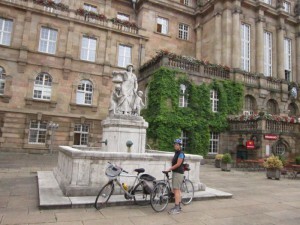 Today we started at Bodenwerder, paused in Hamlin and ended our ride in Minden. The first part of the ride was still along the river, enjoying some forays into the forest alongside it. 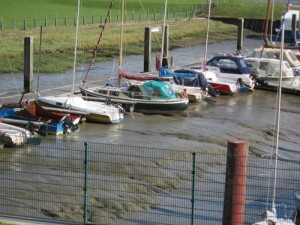 There are regular little villages alongside the river, some with small ferries crossing to them. 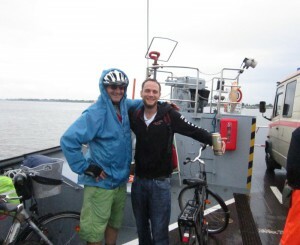 We saw our first Weser tourist boats leaving from Bodenwerder. 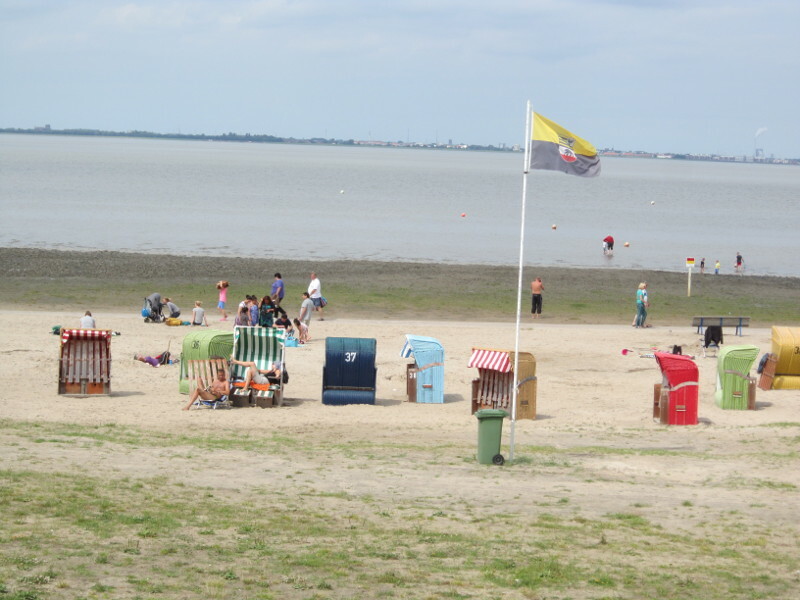 We note that we have never seen anyone swimming in the Weser – we are told that it is too fast flowing. 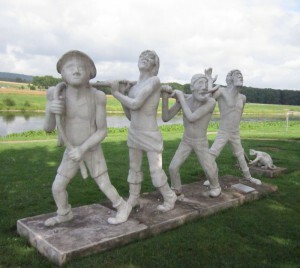 This statue is of men who worked pulled boats up the river. There is a story about how they stole a rabbit stew from an inn keeper. When they returned to the inn he recognised them and got his revenge by serving them a stew made from a cat! 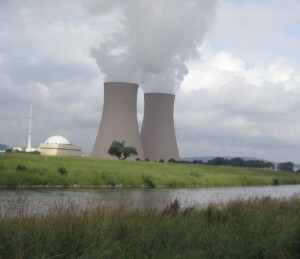 We also saw this nuclear power plant (using river water for cooling) before Hamlin. We did some quick sightseeing at Hamlin and bought some ice cream. Kris bought a pack of 8 from the supermarket. It was more than we could eat, so he gave some away to old people and children on the street. 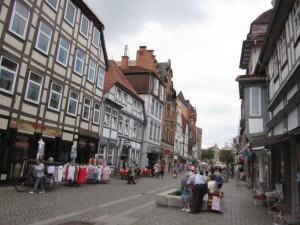 Hamlin has a beautiful town centre with busy pedestrian only streets surrounded by ornate old buildings. Kris was told off by the Police for riding his bicycle in the pedestrian only street. 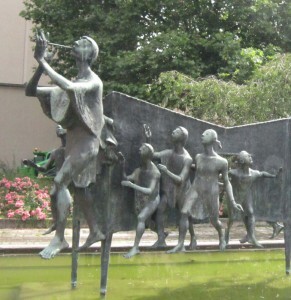 There are also lots of references to rats and pied pipers. 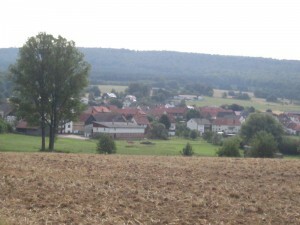 The landscape flattened out after Hamlin – travelling through farmlands with fields of vegetables (runkeln (root crops) – for animals to eat), wheat and corn. 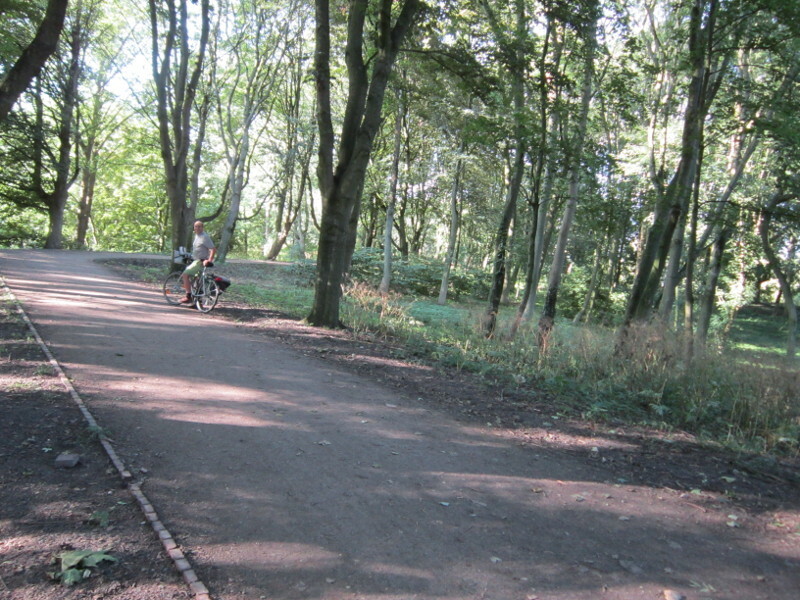 There were also heaps of other cycle tourists on the path after Hamlin (many with electrical bicycles). 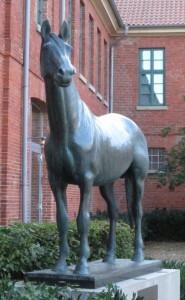 We notice that the buildings are all made of red bricks, with some huge brick farm buildings. 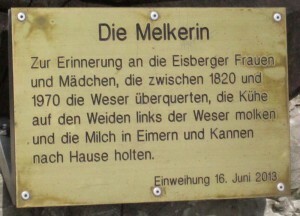 This monument, found at the side of the road, is to the Eisberger woman who crossed the Weser to milk cows in the pastures from 1820 until 1970. 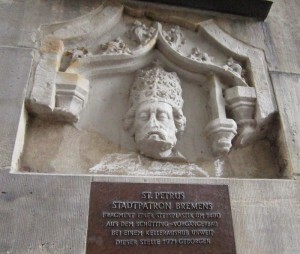 After Rinteln we took a short cut through Porta to Minden. Kris helped a couple of older ladies on touring bikes, one a tiny cheerful Chinese lady, find their way along this route. 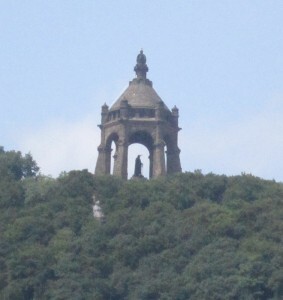 The monument we see on the hill is the Emperor William Monument from 1896 at Porta Westfalica. At Minden the host from our bed and breakfast came to fetch us from the tourist info office and gave us a guided town tour. Minden used to be a military town and has a number of interesting buildings. 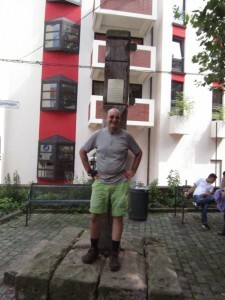 This is a pole they used to tie people to, as a punishment. 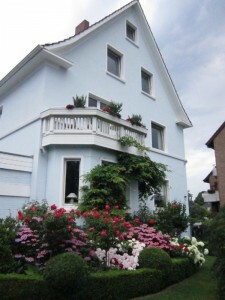 The bed and breakfast rooms are really beautiful – with a shared kitchen and bathroom. We bought some food to cook in the kitchen. 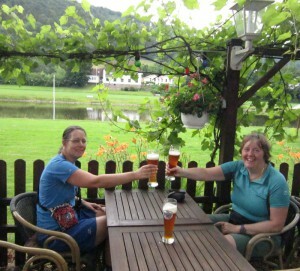 We had some beer in a beer garden before coming back to the house to make our evening meal. Today we continued along the Weser river cycle route, watching the river slowly swell and grow larger. 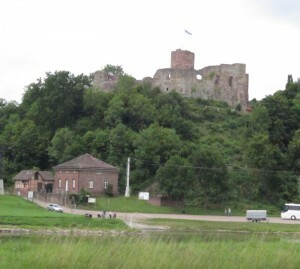 We enjoying seeing small towns at regular intervals, and occasionally a ruined castle or old tower up on a hill. 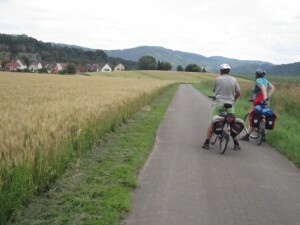 A lot of the ride was through ripe wheat or corn fields alongside the river. 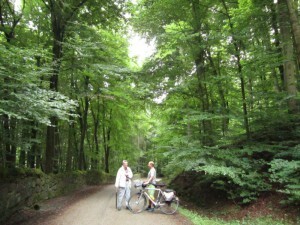 We also had the occasional up and downhill through forested areas. This must be one of the steepest slopes our whole trip (25%) – we had to push, thank goodness it was not very long. We noticed there were very few canoes or any other boats on the river today, but quite a large number of touring bicycles. We wanted to stop for a juice and ice cream at a supermarket in Holzminden, but we became separated from each other twice and spent a long time finding each other again. Eventually we rode on a little frustrated. We reached Bodenwerder at around 3pm and arranged our accommodation through the tourist information (we have huge rooms, very beautifully decorated, but with no wifi). 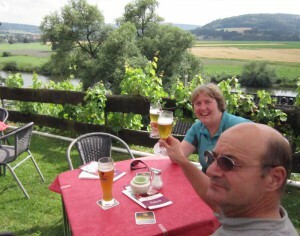 We explored the town and enjoyed a beer at a beer garden on the river bank before doing some shopping. 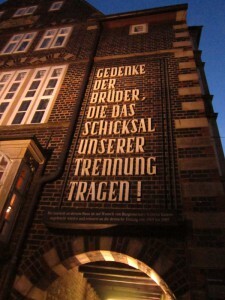 Bodenwerder is the home of Baron Munchausen (18th century), known to be a teller of tall tales. 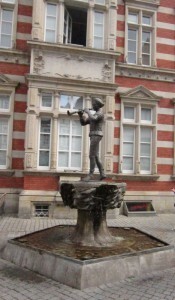 There are a number of entertaining statues all around the town depicting some of his stories. For our dinner we had a picnic supper on the riverbank – after having to move downriver from our original spot because of pesky wasps. 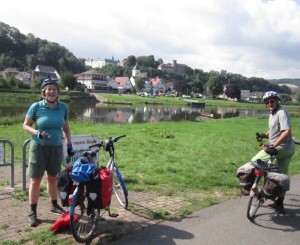 Today was our first day on the Weser cycle route, and also the first day touring with Esther. Kris and I enjoyed the change of pace. Here are Esther and Kris, about to leave from the Kassel hotel after a good buffet breakfast. 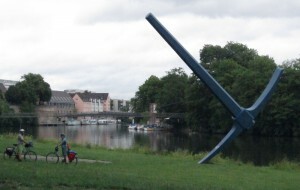 This huge anchor is on the route out of Kassel. 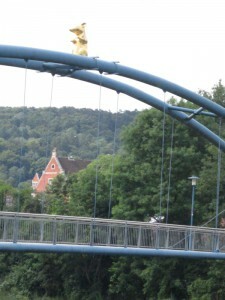 The first part of our route was still along the Fulda river. The bike path was generally good, although we did do a stretch along the road because they are resurfacing the bike path – luckily with very little traffic. 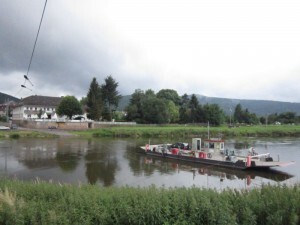 The Fulda joins the Weser river at Han Munden, and the rest of our route followed the Wesser – sometimes directly and sometimes alongside adjoining wheatfields. 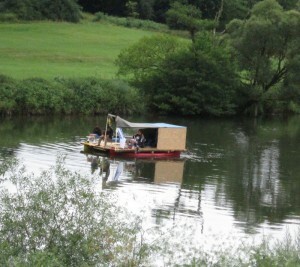 We were amused by these young men and their makeshift covered raft. We had a couple of light showers on the way and one heavy one. During the heavy shower we quickly ducked into a shelter outside a Harley Davidson workshop. A couple of pug dogs appeared and were very interested in the biscuits we were snacking on. 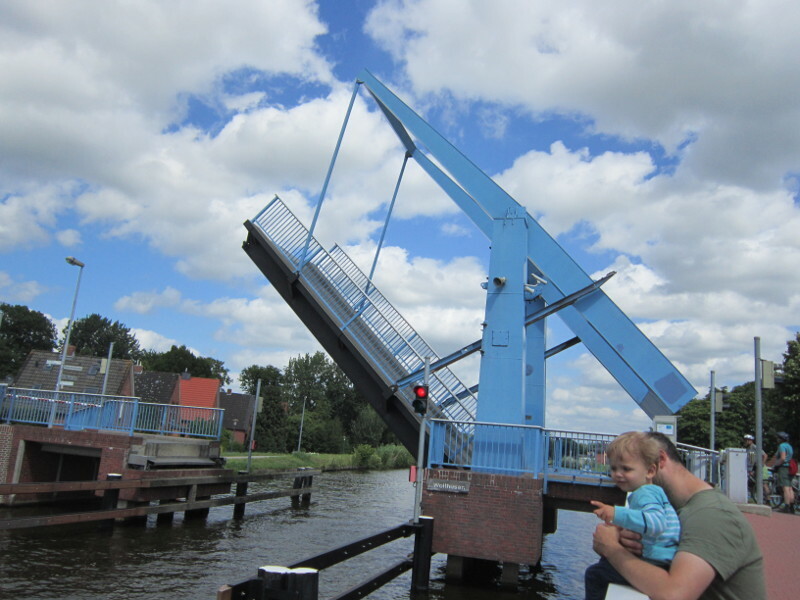 We enjoyed watching this ferry crossing to Reinhardshagen (sorry Reinhard, we didn’t cross but got a couple of photos of your town). 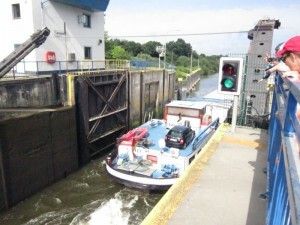 This is another ferry that just uses the river current to power it back and forth, and it takes cars too. 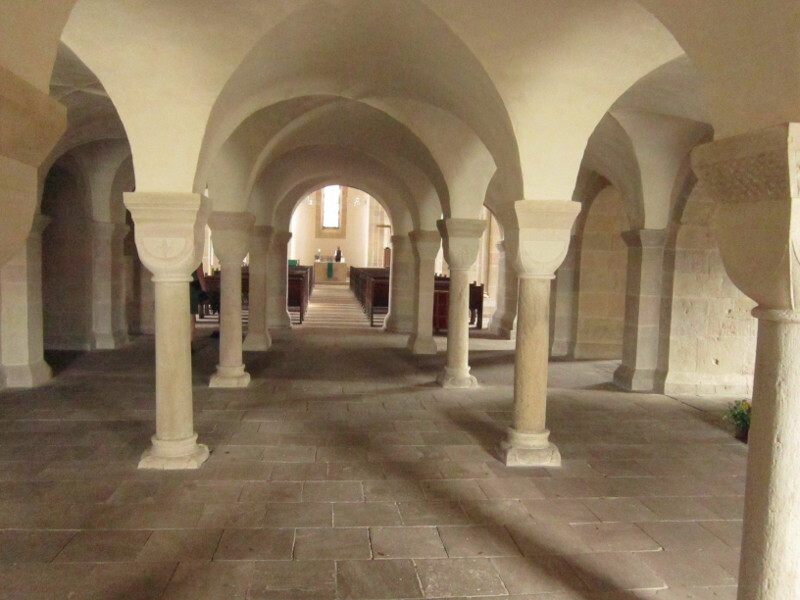 Our next stop was the Klosterkirche St. Georg und Maria in Lippoldsberg – a stunning romanesque church from the mid 12th century. There was an exhibition of paintings by a local artist and music playing in the church to add to the atmosphere. 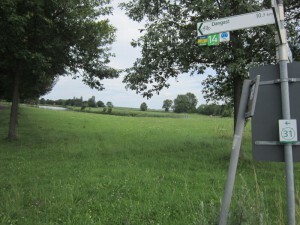 From here it was not far to our destination at Bodenfelde – a 68km ride in all. We found our accommodation in an old fashioned pension quite easily. As we were standing nearby the proprietress walked by and spoke to us – the price was right and they have wifi so we took it. 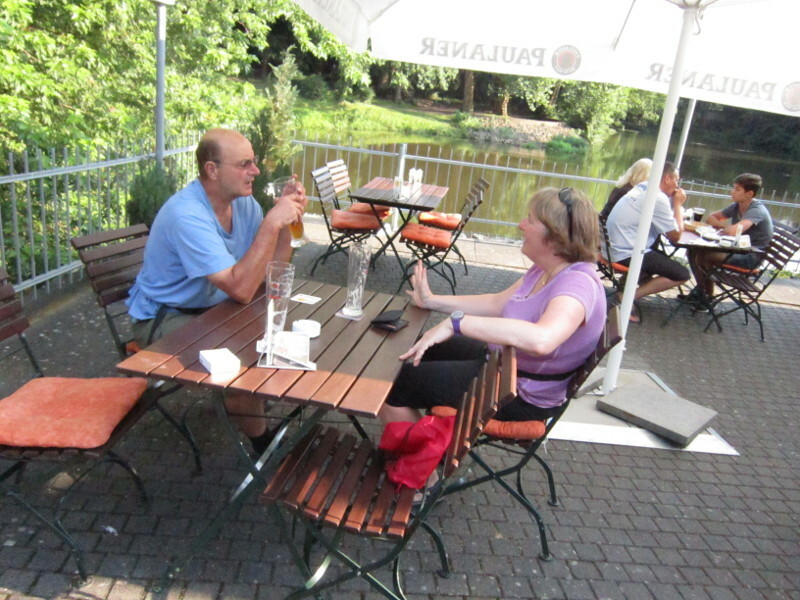 We had a beer at this river front outdoor cafe, and followed that up with a meal at a Greek restaurant on the river – the portions were huge so we ate well! 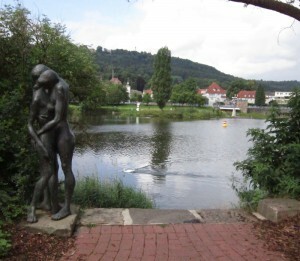 Today we had our planned rest day in Kassel. 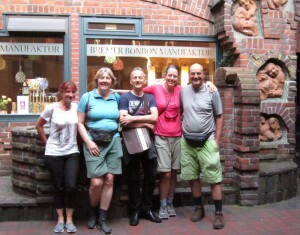 We had arranged to meet Ester in Kassel, so that she can join us on the next part of our tour. We slept late and then explored the city a little. Kassel lost 90% of its buildings through bombing in the war and most of the rebuilding has been in the style of the 1950’s (so no cute old town centre). 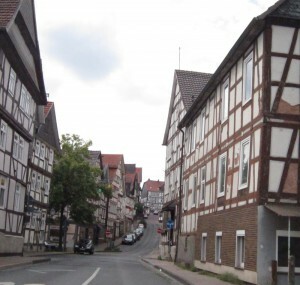 It is known as the town where the Grimm brothers wrote most of their stories. 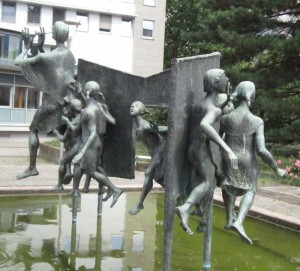 It is also a centre for fine arts, with international festivals every few years. Below is a picture in front of the Rathaus. We went to see the main attraction of the city, the Bergpark Wilhelmshohe, which is a UNESCO World Heritage Site. It is a huge park on a hillside, with baroque water features. 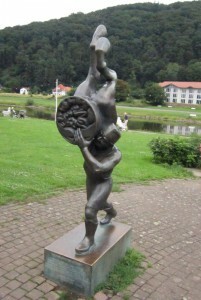 The main feature is a statue of Hercules that overlooks the city with fountains running down from it. Unfortunately the water fountains only flow on weekends and Wednesdays, and Hercules was partly covered in scaffolding, so we didn’t find it that impressive. 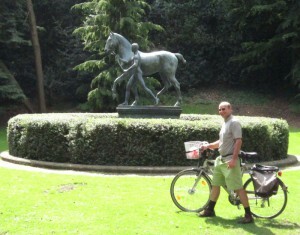 It was hard work riding up the hill to the statue on our rest day – much of it through forested parkland. Here is a photo of Kris asking where the Hercules is. 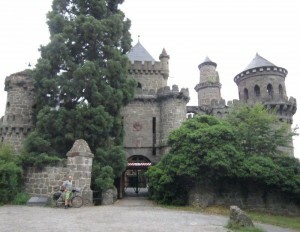 There was also this strange castle, built in the late 18th century to look like a ruined fortified castle at that time. 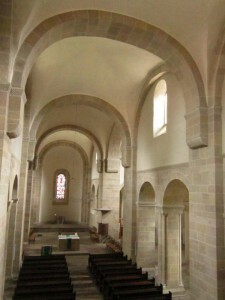 It became an actual ruin after being bombed in WWII and is now being restored again. 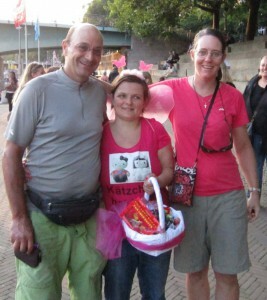 Esther arrived late after having some trouble with the trains (not a good day for her, but at least she got there). Kris went to the station to try to meet her but they missed each other and arrived back at the hotel separately. It was nice to be in the hills again today, after spending so much time cycling along rivers. From Gemunden we climbed for a few km into the Kellerwald nature area. 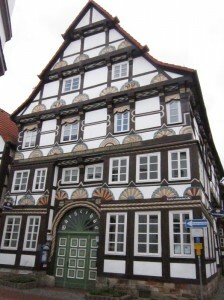 The first town was Dodenhausen – which looked remarkable normal despite its name. 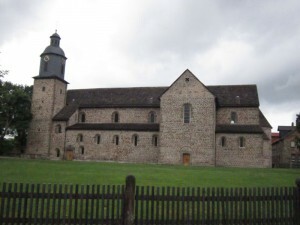 From here it was a scenic ride with lots of little hill climbs, passing through Haddenberg and Hundsdorf. 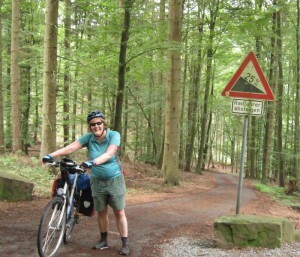 At Hundsdorf we we turned off onto another road that had lots of downhill curves, some through forest, down to Bad Wildungen. 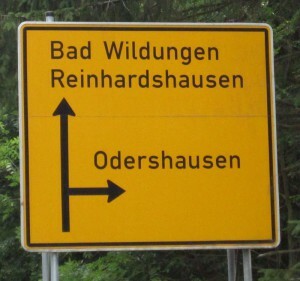 We saw a turn-off to Reinhardshausen along the way. 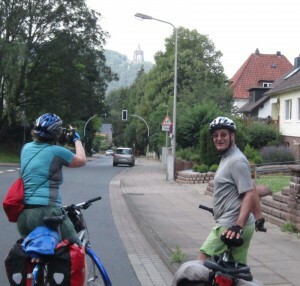 Then we worked our way through suburban roads, to the river Eder, where we found a bike path into Firtzlar. 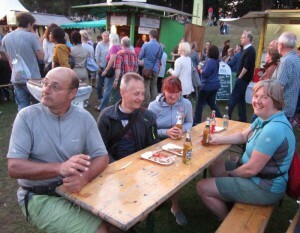 There we had to negotiate a carnival in full swing, with a fun fair and stalls selling all types of goodies – directly on the bicycle path. We continued on the bike path – on rural land – all the way to Felsburg, where we turned to the north and made our way along rural roads to Edermunder. 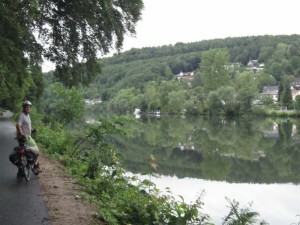 Then we picked up a bike path along the Fulde river into Kassel. It began to drip and then rain as we reached the city. We found our hotel in time to avoid being soaked.